Being a frequent visitor of street booksellers near my faculty, Great Short Stories by American Women edited by Candace Ward immediately caught my attention when I noticed it. I usually read British and Serbia n literature, so this book by American women was a perfect beginning for my exploration of literature from the other side of the Atlantic. From the earliest stories such as Life in the Iron Mill by Rebecca Harding Davis published in 1861 to Nella Larsen’s Sanctuary from 1930, this collection of short stories deals with a variety of topics seen through the eyes of the earliest American female writers. 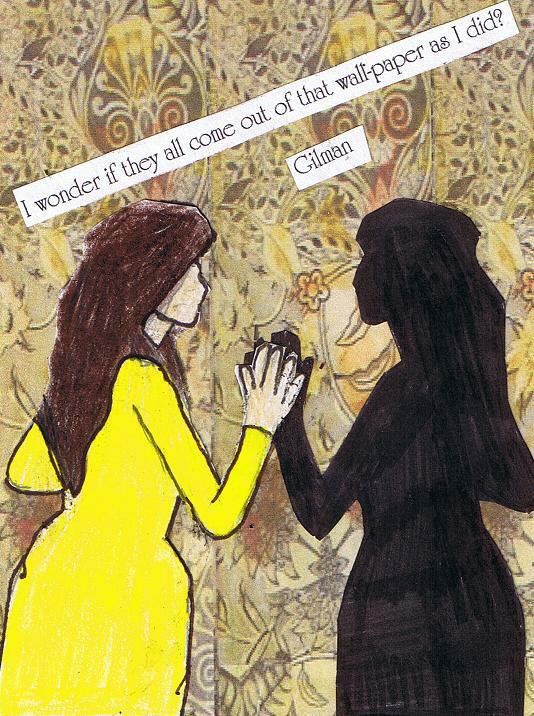 Meandering through the complex web of subjects and motives, I came to The Yellow Paper by Charlotte Perkins Gilman. 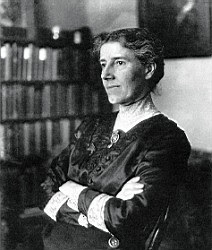 Charlotte Perkins Gilman led an impoverished life during her childhood. Her father abandoned his family leaving her mother with two children. Gilman taught herself to read at the age of five. As a young woman, she was a governess, art teacher and greeting-card designer. She married her first husband, Charles Walter Stetson, with whom she had a daughter Katharine. After giving birth to Katharine, Gilman suffered from nowadays known as postpartum depression. Her husband suggested they consult a famous physician of the time, S. Weir Mitchell who told her that the cure to her condition lied in a domestic life tending her children, complete bed rest and no intellectual stimulation whatsoever. How Dr Mitchell’s prescription influenced her life is the topic of The Yellow Wallpaper. Four years later, she divorced her husband and married Houghton Gilman, her first cousin. In the meantime, Gilman was an active member of several feminist and reformist organizations and she was a writer and editor of the journal owned by of one of these organizations. When she was diagnosed with breast cancer, she took a deadly dose of chloroform at the age of 75 choosing chloroform over cancer. When all usefulness is over, when one is assured of unavoidable and imminent death, it is the simplest of human rights to choose a quick and easy death in place of a slow and horrible one. I have preferred chloroform to cancer. She left three poetry collections, 186 short stories, several novels and dramas and a host of non-fiction works of feminist nature. The Yellow Wallpaper recounts the story of a women suffering from postpartum psychosis. The narrator begins her story with a statement that she believes there is something queer about the house her husband has rented so that she can properly rest. Her husband does not believe her. John laughs at me, but one expects that in marriage. He does not believe she is suffering from a nervous condition even though he is a physician. More precisely, no one believes there is anything wrong with her. She takes medicines and she is forbidden to write. The events in the story are written in her diary she hides from her husband. The very beginning of the novel tells us something about the position of women in the man-centred society. Even though the narrator describes her husband as very careful and loving, he constantly undermines his wife’s nervous breakdowns telling her that she only needs a rest. All her complaints are attributed to her wild fancy. She spends days in a nursery room with barred windows. She hates the dull room, especially the yellow wallpaper. She hates its patterns and its yellow colour. It [the wallpaper] is dull enough to confuse the eye in following, pronounced enough to constantly irritate and provoke study, and when you follow the lame uncertain curves for a little distance they suddenly commit suicide- plunge off at outrageous angles, destroy themselves in unheard of contradictions. The colour is repellent, almost revolting; a smouldering unclean yellow, strangely faded by the slow-turning sunlight. Gradually, the narrator starts seeing a broken neck and two eyes in the patterns of the wallpaper. This image develops into a figure appearing on the paper. She spends hours observing it. Finally, she sees a woman creeping behind the pattern. She spends day and nights observing her. She talks with her husband and tells him she does not want to be here anymore, but to no avail. He tries to soothes her in a rather controlling and patronizing way telling her that there is nothing so dangerous, so fascinating, to a temperament like yours. It is false and foolish fancy. Her foolish fancy sees a woman trapped behind the bars in the wallpaper. She is watching her all night and then sleeps all day. The women is locked behind the bars unrelentlessly shaking them as she wants to run away, but she can’t. The culmination of the story begins when the narrator starts tearing up the wallpaper to release the women behind the bars. Suddenly, the narrator is convinced that there are many women in the room creeping around her. They are finally free. One of them is the narrator. I’ve got out at last, said I, in spite of you and Jane [her husband’s sister]. And I’ve pulled off most of the paper, so you can’t put me back! She locks herself in the room. When her husband unlocks the room, she starts creeping around it and her husband faints so that she had to creep over him every time. This short story teaches us about the subordinate position of women in society, especially in marriage at the time. Their only roles being to look after a husband and children, any kind of self-expression of a woman was impossible. The symbolism of the yellow wallpaper as a tangled web of patriarchy, conservativeness and tradition is present even today. The story helps us understand not only the position of women in the 19th century, but their position in the 21st century, as well.